Several days ago I tried out the zinc finish on a small mirror frame. I liked how it came out so tried it on a larger piece. This end table would have been a challenge to paint with anything other than a sprayed-on finish because of limited access to the two shelves but I had to be a contortionist to get at them with a paint brush. Seems like I've been drawn to end tables lately - maybe because they're frequently "orphaned?" This sturdy end table is all dressed up in Teal Zeal by Behr, lightly distressed and then antiqued with a Graphite glaze. Here's what it looked like before it was saved and "dressed." I've been wanting to try a zinc finish so decided to start small. 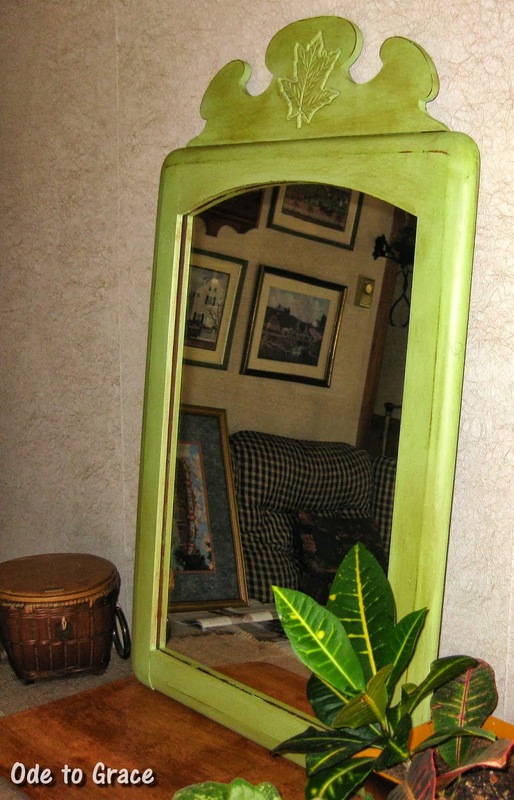 No before photo but this mirror has a wood frame that was in a dark finish - think mahogany. Now that I've tried it, I can see it on a small piece of furniture - I think I have just the table in my warehouse (still my living room!). 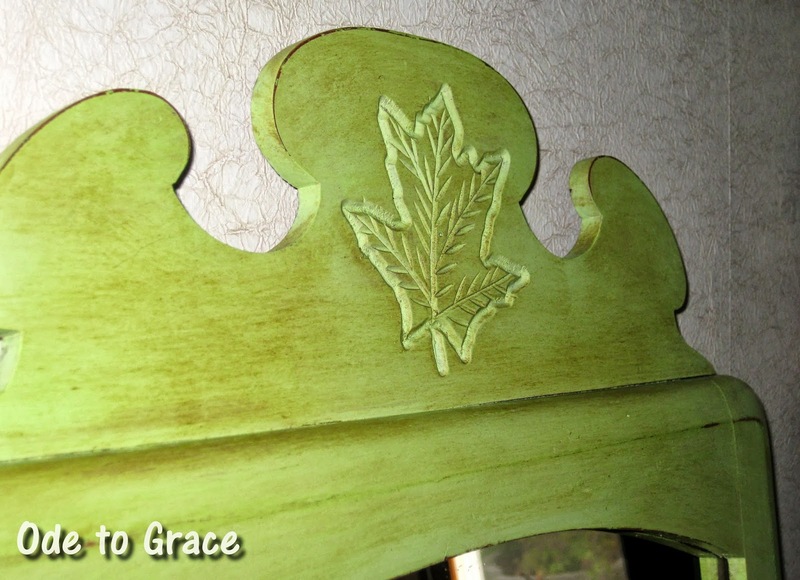 Here's a mirror from the 40's with a maple leaf engraved - I guess that's because the frame is made of maple? 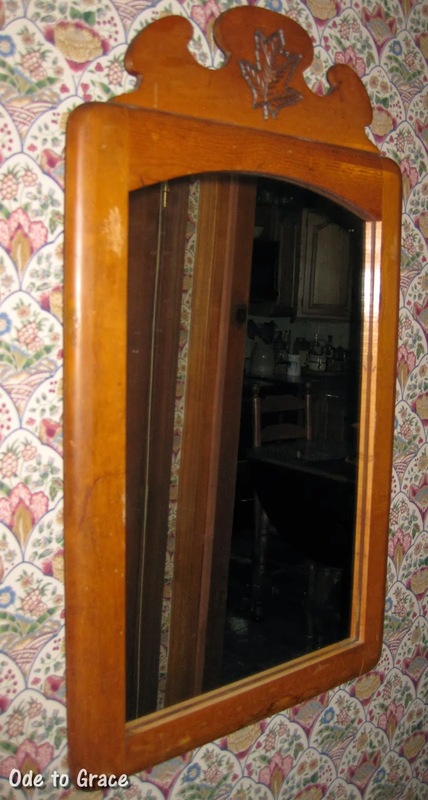 It's a nice, solid piece and the mirror is in good shape but it could definitely use a facelift. Here's the "after," painted with Crocodile Smile by Valspar (a green I've used before) and waxed with Fiddes Antique Brown. 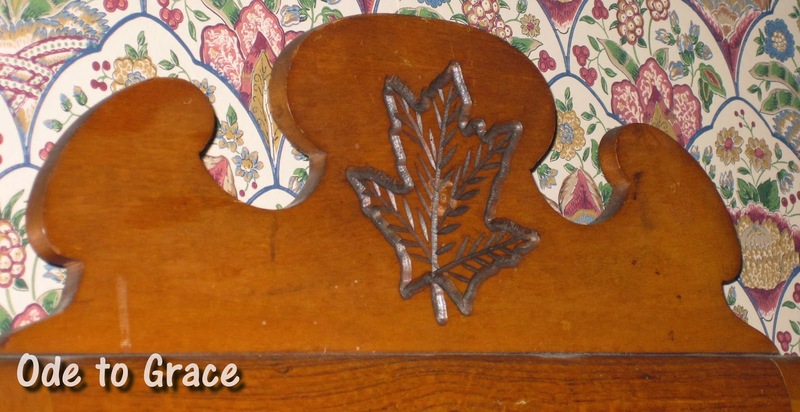 It's lightly distressed and the maple leaf is a little more subtle now. Hope you like it. The up-cycle of the drawer without a desk is complete. It's now a chalkboard - with character! I kept the pen/clip holder and repositioned it to hold chalk, eraser, etc. Love the dovetailed corners & the manufacturer's stamp on the inside. Several months ago when I was just getting back into rehabbing furniture after putting my hobby on hold for many years, I found an office desk curbside. It was big and it was free! It barely fit into the back of my SUV but I just knew I could give it a second life. So... it sat in my warehouse (living room) for months while I worked on other projects and tried to ignore the elephant in the room. I just couldn't wrap my brain around what to do with it. Finally, I decided that even though it was a good, solid wood office desk that it was nothing special and that it just didn't make sense to spend any time or money to rehab it, as big office desks just don't seem to be a marketable piece anymore. So.... I enlisted the help of my assistant (boyfriend) and we cut it up. I now have two separate 3-drawer units that I do plan to rehab. I also kept the large middle drawer, which I also have plans for. I liked that the middle drawer had the wooden holder for pencils, clips, etc., the original manufacturing tag (Jasper Office Furniture, 1952) on the back and manufacturing stamp on the inside of the drawer. I intend to preserve all of this and will have the up-cycled drawer to show you within the next few days. I've been MIA for a few days - some time away and now back to working on some projects! 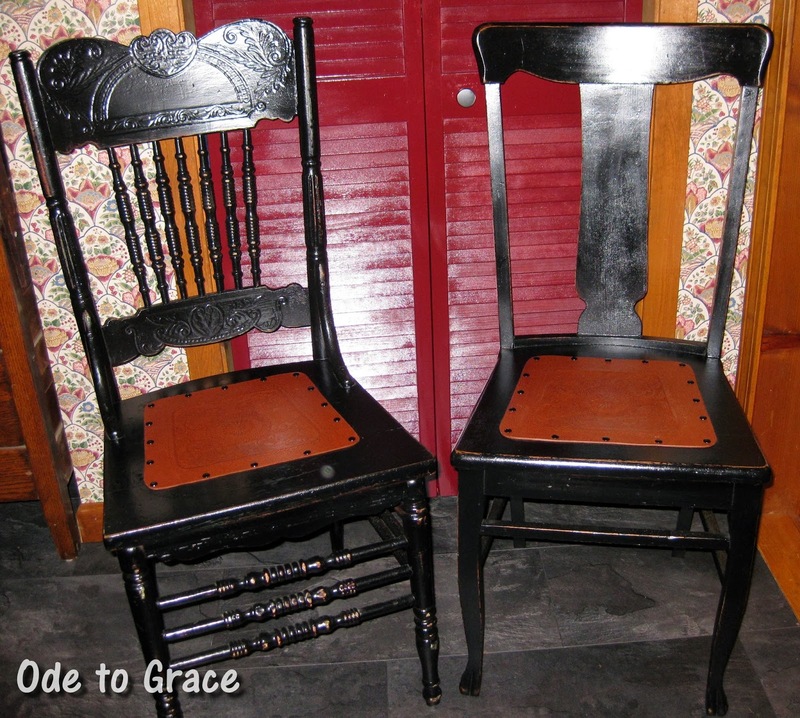 I don't have a before photo of this mismatched pair but there are lots of them around, so use your imagination. I found these two at an estate sale a couple of months ago in my favorite spot - the cellar/basement. They are both oak, solid and no "wobbles" needed to be dealt with so I could concentrate on how to finish them. 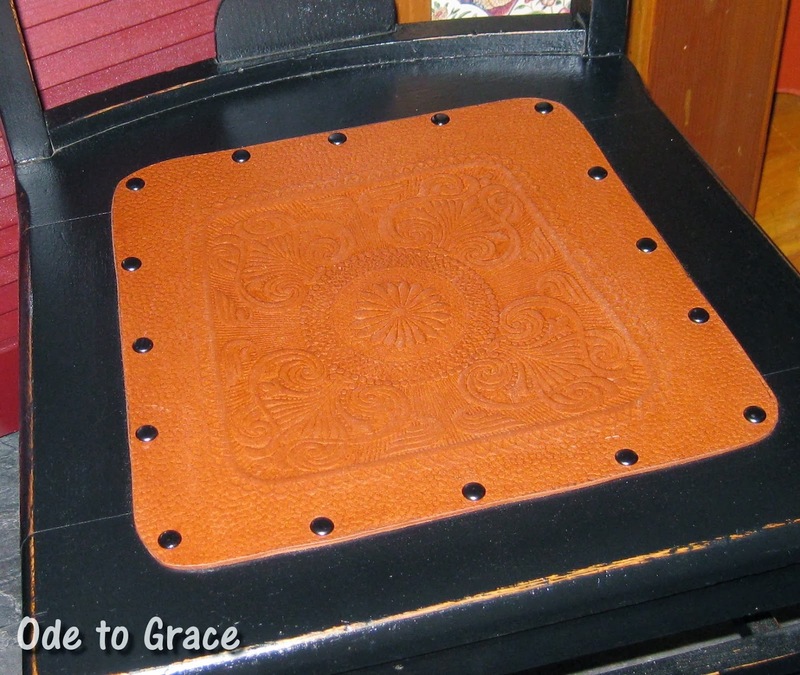 Of course, they were missing the seats, but in the world of rehabbing furniture, that's a minor issue - right? Since despite their differences they did have some basics in common (oak, size, seat type), I decided to finish them as a pair and I think they work well together. 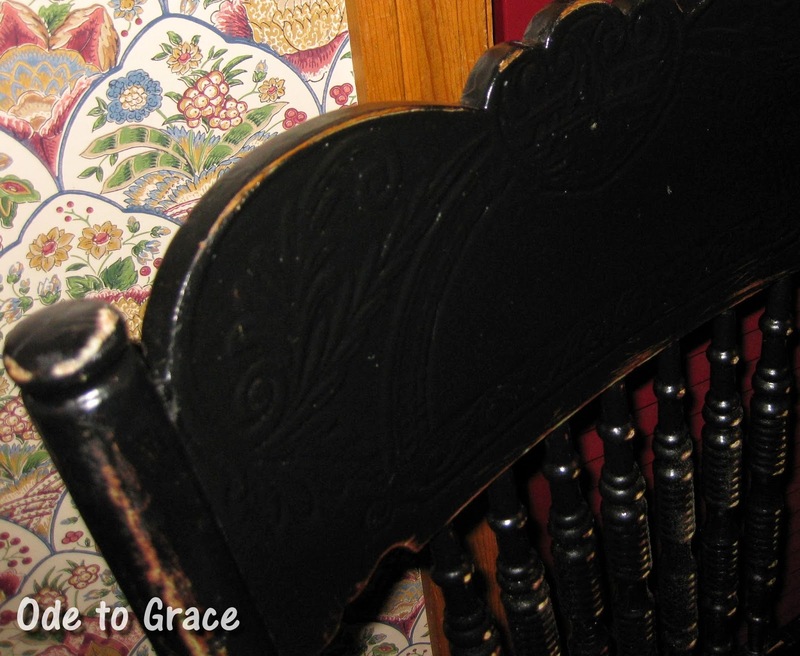 This was the first time I've used a fiber seat to replace cane. It's a quick project, though not inexpensive as I could only find them online. I'll have to keep my eyes and ears open for an alternative.